A detailed new map lays out the landscape of the cerebral cortex—the outermost layer of the brain and the dominant structure involved in sensory perception and attention, as well as language, tool use, and abstract thinking. With the features of a typical brain demarcated in painstaking detail, the new map will be a boon to researchers studying brain disorders such as autism, schizophrenia, dementia, and epilepsy. Scientists will be able to use it to understand differences in the brains of patients with these diseases compared with adults who are healthy. It also will accelerate progress in deciphering the workings of the healthy brain and elucidating what makes us unique as a species. The new map, reported in Nature , divides both the left and right cerebral hemispheres into 180 areas based on physical differences (such as the thickness of the cortex), functional distinctions (such as which areas respond to language stimuli), and differences in the connections of the areas. Brain cartography is not as simple as noting a “mountain” over here and a “river” over there, since much of the brain looks superficially the same. The map is more akin to a map showing state borders than topographic features; the most important divisions are invisible from the sky but extremely important all the same. The researchers drew upon data and methods generated by the Human Connectome Project, a five-year study led by David Van Essen, the senior author of this paper and professor of neuroscience at Washington University School of Medicine in St. Louis,. The Human Connectome Project used a powerful, custom-built MRI machine to map the brains of 1,200 young adults. This study complements the Human Connectome Project by carefully delineating the brain regions so that their connections can be more accurately mapped. The researchers mapped the cortex, a layer of neural tissue that encases the rest of the brain like a crumpled sheet of paper. The cortex is important for sensation, attention, memory, perception, thought, language, and consciousness. A German neuroanatomist, Korbinian Brodmann, first mapped the human cortex in the first decade of the 20th century. He identified 50 regions, including areas later shown to be involved in visual, language, and sensory processing. When the new study’s lead author, Matthew Glasser, began studying the connections between language areas of the brain almost a century later, he quickly became frustrated with Brodmann’s map and how it was typically being used in neuroimaging. To make this map, Glasser, Van Essen, and colleagues pooled data from 210 healthy young adults of both sexes. The researchers combined measures of the thickness of the cortex and the amount of insulation around neuronal cables, with MRI scans of the resting brain and of the brain performing simple tasks, such as listening to a story. Some of those areas are clearly involved in particular tasks, such as 55b, which lights up with activity when a person hears a story. Others contain a map of a person’s field of vision or are involved in controlling movement. Most areas probably will never be identified with a single function, because they don’t do just one thing but instead coordinate information from many different signals. In the century between Brodmann’s map and Glasser and Van Essen’s, many other maps of the cortex have been drawn, showing anywhere from 50 to 200 different areas. The researchers improved on previous maps by precisely aligning the brains to a common coordinate system before analysis, using an algorithm developed by colleagues at Oxford University, and incorporating the highest-quality MRI data available. The researchers also verified that their method could be applied to individuals by producing maps of the brains of a different set of 210 healthy young adults. The results are a precise map with unusually crisp borders and an algorithm capable of locating the areas in individual brains, even though each individual is unique in terms of the pattern of cortical folds and in the size and shape of areas on the cortical map. “In the past, it was not always clear whether the results from two separate neuroimaging studies referred to the same area or not,” Glasser says. By using the new map and alignment algorithm, results of separate studies could be more accurately compared. Better individual maps of the brain could be very useful. Neurosurgeons at Washington University already use less detailed individual brain maps when preparing for surgery to avoid damaging the most important areas, such as those involved in language or motor function. 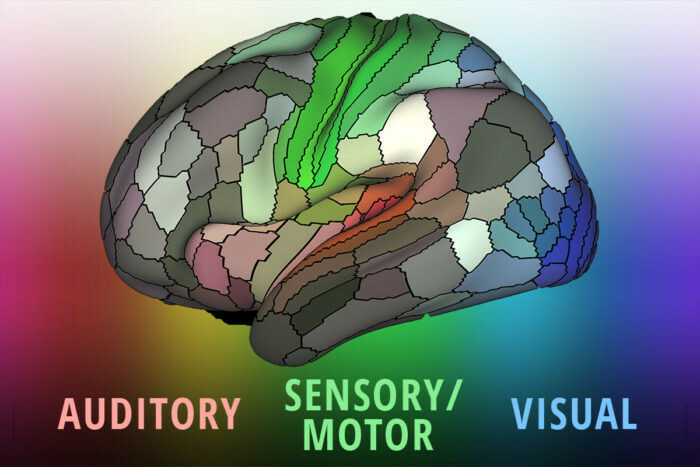 Individual brain maps also could guide treatment for neurological or psychiatric illnesses. Different types of dementia, for example, are characterized by degeneration in different areas of the brain. Clinicians could use the individual maps to personalize treatment, based on the areas affected, or to monitor response to treatment. Like cartographers of old, brain cartographers primarily are providing a tool for others to use in exploration and discovery. The National Institutes of Health, including the 16 NIH Institutes and Centers that support the Human Connectome Project through the NIH Blueprint for Neuroscience Research, supported the work, as did the Wellcome Trust.